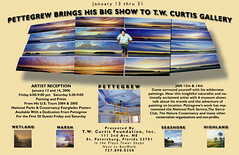 Peter Pettegrew & Matthew Cutter, Two Man Show July 31st – August 1st At Galeria del Mar at 9 King St. in downtown St. Augustine, Florida. Featuring Fine Wines and Tapas dishes, and a live joint painting demonstration. Raised in rural New Hampshire, Matthew J Cutter was introduced to art by his parents at an early age. With their encouragement he spent much of his free time drawing to his heart’s desire. Around the age of ten, Matthew’s grandmother, Helen Cutter, expanded his artistic endeavors by teaching him the basics of painting. They spent many hours together nurturing Matthew’s talent, which would prove crucial to his later development as an artist. In his teen years Cutter left the art world behind to pursue other interests, but that early attraction resurfaced in his mid-twenties when he participated in a painting workshop with listed American artist, Morgan Samuel Price. From there his interest grew deeper and he looked to the works of the Old Masters, such as John Singer Sargent, Joaquin Sorolla, and the California Impressionists to further his knowledge of painting. Present day painters such as Richard Schmid, Scott Christensen, Matt Smith, and Daniel Gerhartz have also influenced Cutter. Matthew’s emergence to the art world has been a slow process culminating in his first one-man-show in February 2006. The show was a great success with 30 originals selling on opening night. It is worth noting that while Cutter’s pursuit of art is not a full-time opportunity at this point in his life, it is a full-time passion. He has traveled to places such as Taos, NM, the Smoky Mountains and St. Kitts in search of subject matter and he currently resides in St. Augustine, FL. Peter Pettegrew has devoted his life to capturing the timeless beauty of the natural landscape on canvass. As a youth, his world was centered around Monterey Bay, California, and it was here that his compelling encounters with the ocean inspired sketches. As early as four years of age, his aunt, who was a painter, recognized his talent and insisted to his mother that he only be given blank paper; no coloring books. Childhood sketches symbolized the sights and sensations of ocean landscapes, and soon more serious efforts resulted as he turned to painting. By ten years of age, the artist was already studying with one of the older marine painters in the Bay Area. His formal art education began when he applied and qualified for admission to Harbor Senior High in Santa Cruz, California, a prestigious and progressive school dedicated to advancing the development of artistic skills and creative freedom. After moving to Florida, Pettegrew went on to attend the Art Institute of Fort Lauderdale, where he studied painting as well as graphic art techniques that he now employs in his work with hand-pulled serigraphs, stone lithographs, and originals. After his formal education, he furthered his schooling in individual mediums through private artist workshops, including oil painting, watercolor techniques and charcoal drawing. Finding his inspiration through detailed research of the Master Impressionists and plein air painters of the 19th Century, this work revealed the undeniable course for his life, “to honor the face of nature by painting her portrait in so many ways and in so many places.” His captivating impressionistic style, using delicate tones, subtle luminous lighting, and savory blends of color, has resulted in distinctive paintings for his collectors. From childhood, the landscapes have always been the beloved subject for Pettegrew’s passionate creations. A naturalist, and outdoorsman, he camps, hikes, and explores, to find his timeless compositions. It is this focus, this need to completely lose himself in the wilderness in order to paint, breathing in the air of dawn and dusk, that nurtures the inspiration he pours onto his canvases. He draws inspiration from his diverse travels. In the last few years he has been to France, the Bahamas, Montana, and California to capture his subject. Most often he is painting in the Southeastern United States. His home and studio are in Orlando, Florida, with another family residence on Marco Island, not far from the Big Cypress Swamp in the Everglades. You are currently browsing the Peter Pettegrew blog archives for July, 2009.